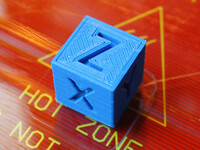 Dual extruder offset tuning tool by nirfriedman is licensed under the Creative Commons - Attribution - Share Alike license. I created this tool to help calibrate the tool offset between dual extruders heads. This is a Vernier scale, where each line represents a shift of 0.05 mm. 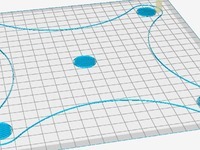 Print this with two extruders and see at what point in the scale they align. If your offset is exact the alignment should be around the middle (long) line. It is still hard to read the exact offset, but the example in the photograph I believe that the white should move about ~.1mm to the left (the current distance is too long, as the white is the right extruder). Say thanks by giving nirfriedman a tip and help them continue to share amazing Things with the Thingiverse community. Say thanks and help nirfriedman continue to share amazing Things with the Thingiverse community. You'll need a PayPal account to tip nirfriedman. Click the button below and you will be redirected to PayPal. Once the payment is complete, you'll be brought back to Thingiverse.